CASE: 42mm Stainless Steel, lyre lug moonwatch case, acrylic crystal, black tachymeter bezel & sapphire display case back (without professional) and numbered. CONDITION REPORT: This dial is in mint condition with a beautiful cream color patina on the tritium indexes and also within the hands. The case shows signs of wear but no major damage. The bezel has a slight indent between 75-80 on the tachy, but overall intact. There is a scratch on the back of the bottom right lug. The bracelet is in perfect without stretch and original owner claims to have never worn it on metal, but rather a leather strap. The movement is clean and shows some slight patina from aging, but running properly at the time of the condition report. 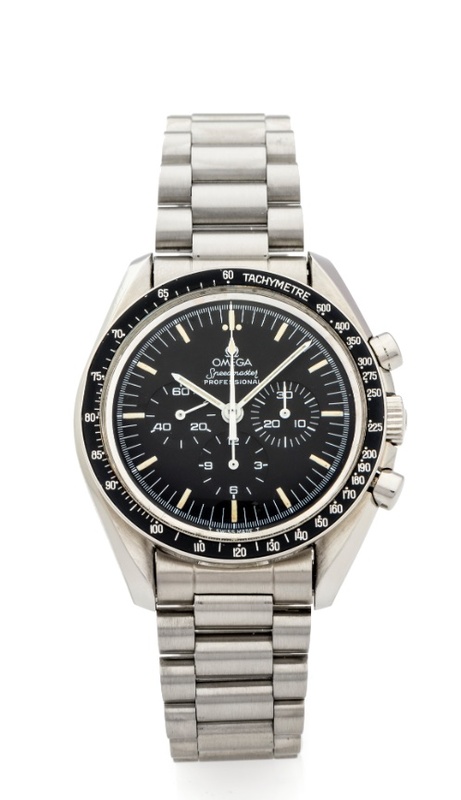 Released in 1985, the 345.0808 was the first Omega reference to be fitted with a see-through sapphire display caseback. As of 1986, a numbered edition of 1000pcs was issued within the serial number range of 48169000 to 48169999. These pieces had a numbered caseback and the same number was also engraved between the lugs. The sapphire caseback displayed a copper movement decorated with Côtes de Genève finishing named 863 (a decorated version of the 861).